We had a wonderful gathering yesterday at the San Diego Convention Center. I first heard about the demonstration last Wednesday from my friend Sheila. (thank you Sheila!) She belongs to a San Diego Community Farm & Garden meet up group and it was Carly who first suggested getting people together to demonstrate. Everyone was terrific about getting the word out. I think we had at least 100 people there with only a 3-4 day advance notice. The signs were fantastic and Tim spent over an hour leading us in some great chants as we marched in front of the convention center. It’s been so long since I’ve demonstrated, that I wasn’t sure what to expect. Was the convention center going to tell us to leave? Would the police come? Well, the security at the center was wonderful. They only asked us not to block the crosswalks and other then that left us alone. The people from the conference for the most part were great as well. Some ignored us and some took brochures and flyers and asked questions too. My hope, with Moms For Safe Food has always been to educate. 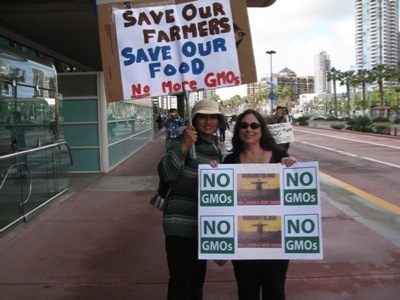 I think there are many people who still don’t even know that GMO’s exist and I do think we reached a great number of people yesterday. It was such an empowering experience joining together with a group of people who are also committed to spreading the truth of what Monsanto is doing to our food supply and environment. It is my sincere hope that this is the first of many more demonstrations. Power to the People!